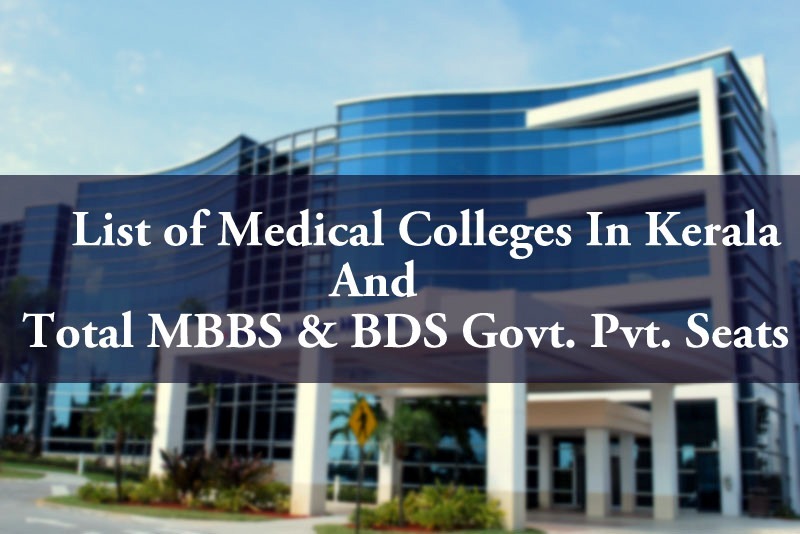 List of Medical Colleges In Kerala Total MBBS BDS Govt. Private Seats: Here is the list of MBBS & BDS Medical colleges in Kerala State. In this list, we have included government, private, and self-financing medical institutions in Kerala. There are 14 governments and 21 privates self-financing medical colleges. In January 2016, Kerala became the first Indian state to achieve 100% primary education through its literacy programme Athulyam. Every year, lakhs of candidates are graduating in different courses from Kerala state. All MBBS and BDS medical seats will be filled through National Eligibility Entrance Test (NEET) 2018 which will be conducted by the Central Board of Secondary Education (CBSE). Interested candidates will be able to fill the NEET UG 2018 Online Application Form from the CBSE NEET official website. All candidates who are preparing for Medical entrance exam should know about best medical colleges in India. By knowing best colleges candidates will be able to select the best college during the counselling. Below we have listed all govt & private medical colleges in Kerala state. Azeezia Institute of Medical Science, Meeyannoor, Kollam Kerala University Trust 2008 100 Permitted for renewal of permission u/s 10(A) for the year 2012-13. Govt. Medical College, Kozhikode, Calicut Kerala University Govt. 1957 250 Recognized for 200. Permitted for renewal of permission for increase of seats from 200 to 250 for 2012-13. Govt. Medical College, Thrissur Kerala University of Health and Applied Sciences, Thrissur Govt. 1981 150 Recognized when granted on or after October 2012. Kannur Medical College, Kannur Kerala University of Health and Applied Sciences, Thrissur Trust 2006 150 Recognized for 100 seats when granted on or after July, 2011. (Previously under Kannur Univ. )Permitted for increase of seats from 100 to 150 u/s 10(A) for 2012-13. Karuna Medical College, Palakkad Calicut University Trust 2006 100 Recognized when granted on or after October 2011. KMCT Medical College, Kozhikode, Calicut Calicut University Trust 2008 100 Permitted for renewal of permission u/s 10(A) for 2012-13. Sree Narayana Instt. of Medical Sciences, Chalakka, Ernakulam Mahatma Gandhi University, Kerala Trust 2009 100 Permitted for renewal of permission u/s 10(A) for 2012-13. Travancore Medical College, Kollam Kerala University Trust 2009 100 Permitted for renewal of permission for the year 2012-13. How does one apply for management seat in mbbs, in pvt institutions, kerala.